The name ‘Fibonacci sequence’ refers to a series of numbers in which each number is the sum of the previous two. Named after medieval Italian mathematician Leonardo Fibonacci, who introduced it to Western Europe, it is featured in literature, cinema, the visual arts and music: for instance, the lyrics to the title-track of Tool’s celebrated Lateralus album are arranged on the basis of the Fibonacci sequence. On the other hand, even if Fibonacci Sequence would be a perfect name for a math-rock band, the Milwaukee-based trio bearing this name are quite a different beast. Those who delight in sticking labels on everything and everyone will certainly have their work cut out for them with a band like Fibonacci Sequence, as their unabashed eclecticism makes classification all but impossible. While one moment they may conjure shades of progressive metal, the next passage will take the listener into almost symphonic territory, with clear, melodic sounds and lush layers of keyboards – not to mention the tantalizing Latin and Middle Eastern references and the sprinkling of jazzy touches. Their omnivorous approach is further borne out by the influences mentioned by the band – a list ranging from Yes, Rush and Dream Theater to The Police, Sting and Mahavishnu Orchestra. For those who thrive on making comparisons with more established acts, I would mention equally eclectic instrumental outfits like From.uz or Djam Karet, as well as more metal-oriented ones like Canvas Solaris or Relocator – as well as the obligatory Liquid Tension Experiment or Planet X. Unlike the latter bands, though, Fibonacci Sequence’s sound is more distinctly guitar-based, with keyboards used as an accent rather than dominating their whole music. Faced with such almost effortless proficiency, which nevertheless does not come across as cold and detached, the listener would be forgiven for thinking that the band are one of the many projects that (often due to practical issues) have no life outside the walls of a recording studio. The band, however, are quite active on the live front in their home town of Milwaukee, and the announcement of their participation to the 2011 edition of ProgDay has whetted the appetite of the numerous fans of instrumental progressive rock. 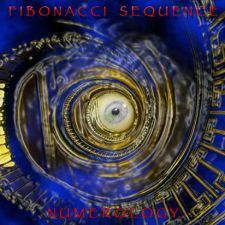 The aptly-titled Numerology, Fibonacci Sequence’s debut full-lenght album, was released about a year after the 2-track EP We Three Kings, which featured a very interesting arrangement of the popular 19th century Christmas carol. On this album, the three core musicians avail themselves of the valuable contribution of fretless bassist Chris Kringel (formerly with Cynic and their offshoot Portal) on all but one of the tracks, as well as bassist Chad Burkholz on “Missing Time”, and violinist Elizabeth Grimm on the last three numbers. Most of the tracks on Numerology run between 6 and 11 minutes, long enough to allow the band members to branch out and create intricate musical weaves; the album as a whole clocks in at a quite manageable 65 minutes. The band manage to produce an impressive volume of sound of exceptional clarity, every instrument given a strikingly dimensional feel in the mix. As in the best productions, in spite of the complexity of the compositions, the music flows smoothly and naturally, without giving the impression of being too complicated for its own good. Right from the opening strains of the short but punchy “Commencement” – a lush, melodic guitar number powered by an impressive drum sound – the sheer quality of the recording comes across in no uncertain terms. While Michael J. Butzen’s guitars take the leading role, the engine propelling Fibonacci Sequence’s music along is Thomas Ford’s powerful yet restrained drumming, a full-bodied sound that manages not to overwhelm the other instruments. Fibonacci Sequence’s trademark blend of melody, heaviness and sleek instrumental expertise emerges in “Neap Tide” (also featured on the EP), a heady, multilayered mix of sharp riffing, acoustic, pastoral beauty and jazzy licks whose dense sonic texture manages not to feel stifling or contrived. On the other hand, “Primrose Path” comes across as a contemporary-sounding version of vintage Santana, down to the jazzy, Latin-tinged guitar work. Perfectly descriptive of its title, “Dawn” is a slow, meditative acoustic guitar piece introduced by atmospheric keyboards and birdsong, which introduces the thunderously drum-driven “Catlord”, its heaviness spiced by Eastern touches in the clean, mesmerizing guitar lines. After the very short ambient piece “Illuminati”, Fibonacci Sequence display more of their exciting compositional skills in the album’s final four tracks, starting with the splendid bass showcase that is “Work in Progress”, peppered by frequent pauses that, instead of disrupting the flow of the music, seem to stimulate the listener’s attention. With “Missing Time” we enter Liquid Tension Experiment/Planet X territory, Jeffrey Schuelke’s keyboards taking more of a lead role and Butzen’s guitar injecting a touch of fiery, yet shred-free edginess, and the violin adding a symphonic note to the second half of the track. The 11-minute “Faunus” (the longest track on the album) is deceptively more linear in structure, with a tense, riff-laden first half and a slow, almost melancholy ending punctuated by lovely guitar and violin; while closing track “Io” picks up from where the previous number left off, with a moody beginning and a mainly keyboard-driven middle section, culminating with an extended guitar solo of outstanding quality. Interestingly, the album begins and ends with the crackling of an old vinyl record – a sound dear to many old-school prog fans. Besides the obvious quality of their music, both in terms of composition and execution, Fibonacci Sequence’s nature of real live outfit makes them an even more intriguing proposition. The simple fact that they are not easy to pigeonhole should be seen as a positive sign, especially in these times when increasingly outrageous labels are created with alarming regularity. In any case, Numerology is one of the finest instrumental prog albums released in the past couple of years or so, and their ProgDay appearance will hopefully contribute to putting Fibonacci Sequence on the map for those progressive rock fans who are still unaware of them. Highly recommended. Great review once again….but should I expect anything less than a well crafted one. I love the way you write about music. Looking forward to the live performance of this band at Progday 2011. So if anyone is reading this review and my comments make sure to catch them this year live in Chapel Hill, NC at Progday on Labor Day Weekend! Yes Great Band, Great Review…! I didn’t know this band, then I just listened to a few samples of their Numerology album. Clear and smooth sound, very nice to hear. Oh and also important, the whole album is well mixed and doesn’t suffer from overcompression, so common these days. Good album, indeed. The album is excellent, and the band are also great on stage (and a bunch of very nice guys, which is never a bad thing in my book). Looking forward to their new album!